I am the first to admit that I've had some struggles in the gluten-free baking department. Therefore, I don't do it very often. 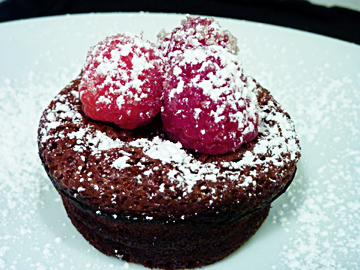 But when I do—and I need a desert that is sure to impress—I make these Moist Chocolate Cakes. They are super easy, require only a few ingredients, and turn out great every time. This recipe is exactly what every wounded gluten-free baker needs in her life. Melt butter and chocolate in double-boiler. This is my crafty version of a double-boiler because I don't have a real one. Simply put a few inches of water in the pan, place a heat-proof bowl over the top and away you go. It works well. 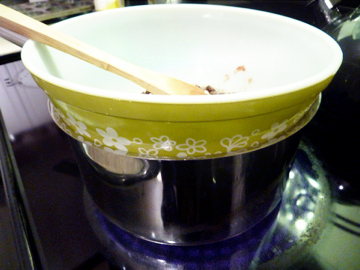 Continue stirring butter and chocolate until melted; remove from heat and set aside. In a separate bowl, beat the eggs, sugar and salt until the sugar has dissolved. It would be ideal to use a hand mixer. If you don't have a hand mixer handy, simply use your hand to mix her. Now combine the egg mixture with the chocolate mixture. Beat until smooth. Stir in the rice flour, just until combined. Don't over stir. These things are touchy. Line the muffin tin with 12 muffin cups. Spray the cups with vegetable cooking spray. This will help in your presentation later, if you're trying to be fancy with it. Divide batter evenly into the cups. 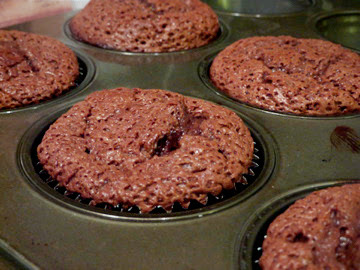 Bake for approximately 8 to 10 minutes, or until batter puffs just a bit but the center is not entirely set. In the meantime, grab some fresh raspberries and granular sugar. Wet the raspberries slightly and roll them around in the sugar to coat. 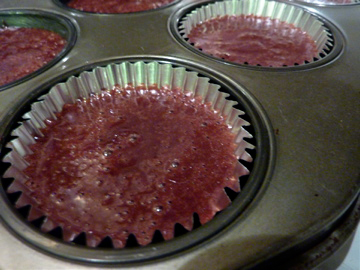 Carefully unwrap the baking cups from the cakes and transfer to desert plates. 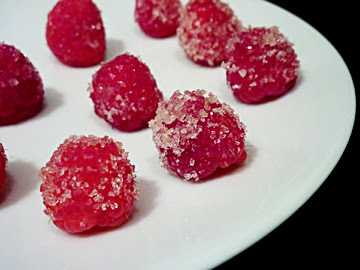 Top with the sugar coated raspberries and dust with a light covering of powdered sugar. Serve immediately. 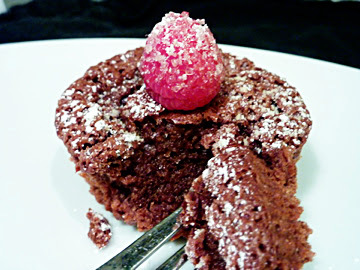 The fresh raspberries serve as a healthy topping for the chocolate cake. Yum! I love white chocolate. I've got to give that a try soon!